Address: Germany, DE-85737 Ismaning, Carl-Zeiss-Ring 21. Finepower is a leading sales- and engineering company focused on innovative applications in the field of power electronics. Since 2001 we are acting as a successful and professional partner for our customers and suppliers. By employing newest technologies and innovative solutions we contribute substantially to the reduction of energy consumption and environment saving. Our services are very important to the solution of our customers in the continuously growing market segments. (Automotive, Industry, Renewable energy, Consumer, Telecom). Finepower offers Services in Marketing, Sales and Engineering. Engineering: Finepower’s versatile team of experienced designers holds significant specific know how and performs the conversation of fastidious technical challenges into solutions. Supported by advanced laboratory equipment and modern hardware and software tools, our engineers can reduce and optimize the design time. Beside the development of power electronic systems, we are also specialized on the design of complex magnetic power components, thermal calculations and electrical simulations. Marketing & Sales: Our marketing services are based on Finepower’s know how in power electronics and power management applications. Long-time experienced experts elaborate individual solutions for growing the business in the target market segments of our customers and partners. Finepower acts as a representative company for leading manufacturers and suppliers in power electronics. Our powerful and motivated sales force provides the market access for innovative products of our partners. Focussed on the target application we are an appreciated and competent partner for purchase and development. 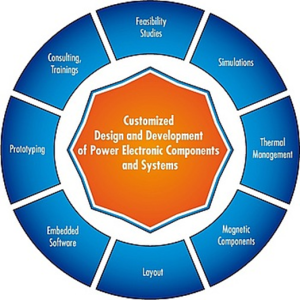 The power electronic engineering at Finepower offers the wide range of services from consulting to prototypes which are base for series production. In order to provide this engineering the relevant tool and equipment is available, e.g. simulation- and layout- tools, power- and measurement equipment, mechanical design for prototype as well as the possibility to measure conducted EMI.